Rajasthan Department of Technical Education (DTE) is going to release the Diploma Engineering 1st Round Seat Allotment on 4th August. Aspirants eager to check the Rajasthan Diploma/Engineering merit list can download from DTE Rajasthan’s official portal, dte.rajasthan.gov.in. aspirants shortlisted in the merit list will get admission for the academic year 2018 -19. Rajasthan LEEP Lateral Entry Merit list is scheduled to release on 7th July. After the declaration of the merit list, students will have to proceed with the seat allotment and admission process. The Rajasthan DTE will offer the admission for aspirants into various courses of Diploma and Engineering. Students can select their interested branch while giving the preferences in the time of admission. Check more details like admission dates, seat allotment other details from this article. Department of Technical Education, Government of Rajasthan is the technical education department of the state which especially monitors the Engineering and Diploma courses. The DTE Rajasthan offers admission for students into regular and lateral entry candidates. For admission into Diploma courses candidates have to have the minimum educational qualification of 10th /12th pass. Based on the past educational qualification candidates will get admission into Diploma course. Candidates with the educational qualification of the Diploma/12th pass will get admission into Engineering course. The DTE Rajasthan will offer admission based on the merit of aspirants in their previous academic merit. Candidates shortlisted in the merit list can get admission in their desired college /branch at the time of admissions. Course Name DTE Rajasthan polytechnic Second-year Diploma Engineering. Courses Offered Various Diploma & Engineering Courses. Rajasthan DTE has started the LEEP application form in the months of June/July. A huge number of aspirants seeking admission in Rajasthan Diploma courses have applied for DTE Rajasthan Diploma Engineering courses. 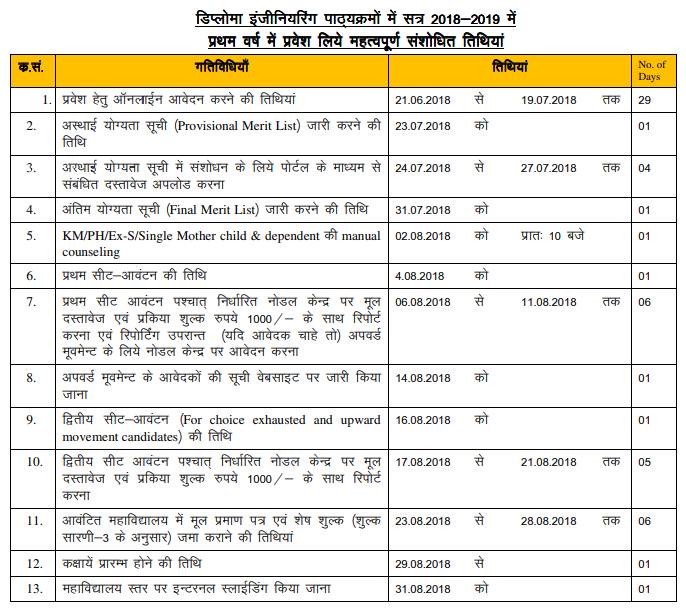 Candidates applied for DTE Rajasthan LEEP admission can check the important dates from the following. Steps to Download Rajasthan DTE Diploma Engineering First Round Seat Allotment Results 2018? Check for the merit list link on the homepage. Click on it and provide the details of register number, password etc. Merit List/Seat allotment list will appear on the screen. Check the list and take a printout.